Portugal has turned a corner. Having gone through a mild boom, a slump, and a severe recession, all packed into less than two decades, the Portuguese economy has re-emerged with a newfound strength. This column examines this recovery in detail, focusing on important structural reforms that have taken place in the last couple of decades in key areas such as skills, investment, export orientation, labour market, financial intermediation, and public finances. The effects of these reforms were compounded by time as well as efforts to reignite demand. 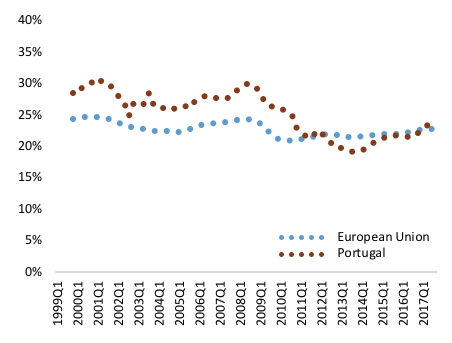 In the run-up to introduction of the euro in 2002, perceptions about Portugal’s economic prospects and investment risk changed, resulting in a substantial increase in private debt and a mild domestic demand-led boom. The boom gave way, in the 2000s, to a decade of protracted growth, worsening labour market conditions, steady accumulation of external imbalances, and rising debt. Since then, the Global Crisis and the European sovereign debt crisis conspired to push the economy into a severe recession and led the country to embark on an adjustment programme overseen by a troika of creditors. GDP fell 7.9% from peak to trough, while employment declined 13.4% (Figure 1). Unemployment peaked at 17.5% in 2013 (youth unemployment hit 40%). 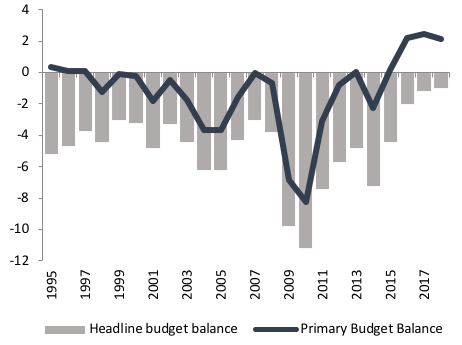 Fiscal deficits rose to around 10% of GDP (Figure 2). Portuguese sovereign bonds were downgraded to ‘junk’. Nearly 500,000 people emigrated between 2011 and 2014 – the largest emigration the country had experienced in 50 years. Early signs of recovery in 2014 and 2015 turned out to be feeble and short-lived. Growth would eventually pick up with renewed strength in 2016Q3, and accelerated further to 2.7% in 2017 (Figure 1) on the back of a 9% real increase in investment and 7.9% growth in exports. Employment rose 3.5% in 2017Q4 (year-on-year), while unemployment receded to 7.4% by 2018, its lowest level since 2004, and the labour force resumed an expansionary trend. This is now a sustainable recovery. Fiscal deficits plunged to 2% of GDP in 2016, and 0.9% in 2017, the lowest in Portugal’s democratic history. In structural terms, this implied a reduction of 1.4 percentage points in two years, above what is envisaged in the Stability and Growth Pact. The stock of public debt fell 4.3 percentage points in 2017, the most significant drop in 20 years, while private sector debt (i.e. for non-financial corporates and households) declined to 163.5% of GDP, down from a peak of 210.3% in 2012. 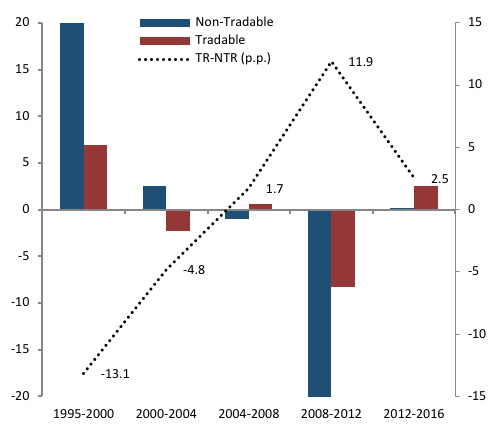 Against this backdrop, the performance of the Portuguese economy in the last two decades is often framed as a process of steady deterioration of price competitiveness and accumulation of imbalances, culminating in a severe recession and a regenerative adjustment programme (Chen et al. 2012, ESM 2017, IMF 2017, European Commission 2016). According to this view, the adjustment programme set in motion a domestic deflationary process that helped restore external competitiveness and, thus, improve economic performance. These improvements, together with tail winds from a synchronised recovery in the euro area, would go a long way in explaining Portugal’s current macroeconomic performance, including the rebalancing of its public finances. We argue this view is fundamentally at odds with existing empirical evidence on the fundamentals of the Portuguese economy and how they have evolved over time (e.g. Gouveia and Coelho 2018). In our view, Portugal’s turnaround is not a simple by-product of a purportedly competitiveness-enhancing adjustment programme, let alone of the vagaries of the external macroeconomic environment. There were elements of the adjustment programme that played important roles, but they are not the be-all and end-all of Portugal’s turnaround. 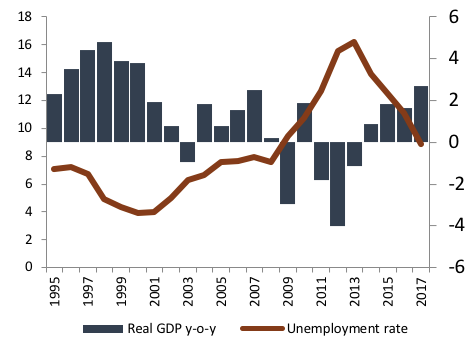 The steady, solid recovery of the Portuguese economy is, in fact, grounded in lasting structural changes in skills, investment, export orientation, and in the labour market, spread across the last two decades. These changes have been supplemented by recent policy initiatives aimed at restoring business and consumer confidence, including measures to repair the Portuguese financial system, policies to support internal demand, and counter-cyclical, rigorous, and prudent management of the public finances. All together, they have made great strides in addressing key structural weaknesses in the Portuguese economy, and have thus helped lay the foundations for a more resilient and prosperous economy. Let us look at the main features of the structural changes that have been taking place under the surface. We start with human capital. 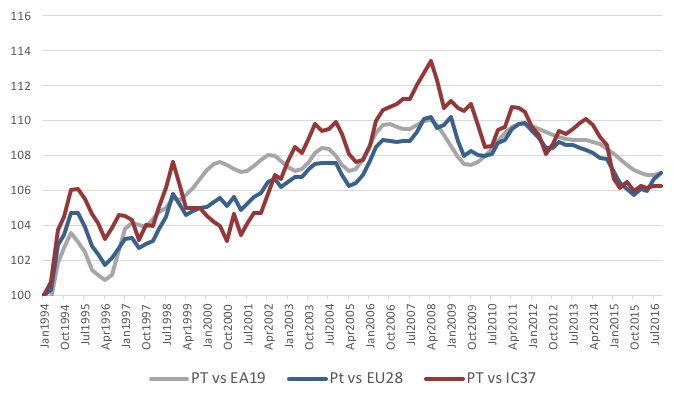 While Portugal’s qualification gap vis-à-vis its European partners remains large (the stock of low skilled workers is 26 percentage points above the EU28), it is falling quickly (10 percentage points since 2004) and is largely related to the legacy of older generations with lower educational profiles (Figure 3). 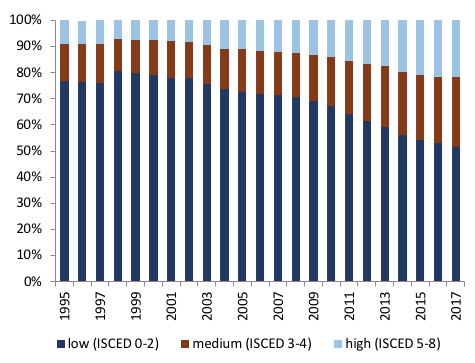 Between 2004 and 2016, the share of adults (15–64 years old) with at most lower secondary education decreased 21 percentage points (from 74% to 53%), while both medium- and high-skilled rose around 10 percentage points (from 16% to 26%, and from 11% to 22%, respectively). Assuming the current flow of the low-skilled into the labour force is kept constant (which is a relatively conservative assumption), one would expect the share of the low-skilled to reduce further from 53% to 42% in ten years’ time, and to boost potential GDP by around 7% (Gouveia and Coelho 2018). Changes in human capital have not been confined to quantity aspects, but have also included quality improvements. Portugal is part of a very small group of countries that have made steady, broad-based progress in the various rounds of the OECD PISA assessments (Figure 4). The results from the latest round (2015) place the country above the OECD average in all areas of assessment (science, reading, and mathematics). These indicators alone portray a society that has been able to cope with structural adjustment in an effective way. This stands in clear contrast to previous periods of structural change, such as that of the 1980s. In 1982 only 2% of private sector salaried workers had a college degree. This figure is now close to 20%. This signals a remarkable increase in skills, and an opportunity that cannot be missed. Moving on to investment. This was the main driver of labour productivity growth in Portugal in the decade before the crisis (e.g. Corrado et al.2016). Business investment, in particular, was systematically above the EU28 average (about 5 percentage points) throughout the 2000s (Figure 5). The crisis took its toll on investment, but there are clear signs that it is recovering well. Gross fixed capital formation increased 9% in real terms in 2017. Business investment is growing again above the EU average. A strong pipeline of EU co-funded investment projects for the next four years is expected to provide an additional boost to investment. These are mostly competiveness-enhancing projects, focused on transport infrastructure, urban regeneration, healthcare and education services, and R&D and innovation. 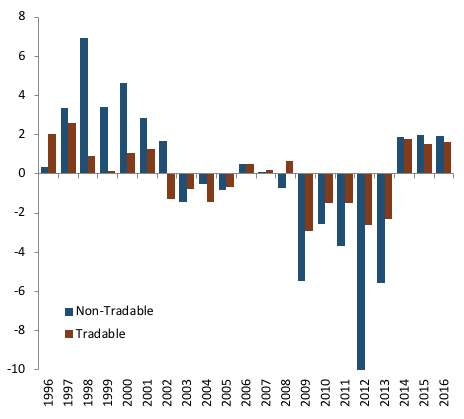 In the wake of the adoption of the euro, abundant capital inflows were channelled to relatively unproductive non-tradable projects, significantly harming economic performance (Dias et al. 2015). Yet, there are clear signs this pattern has reversed in the last decade (Figure 6). 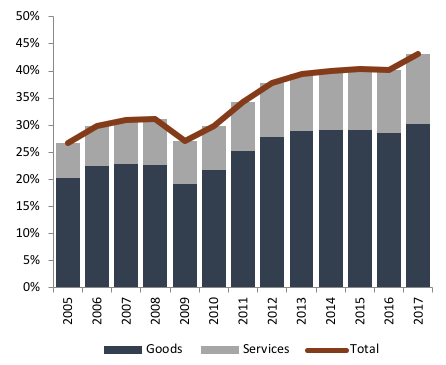 The weight of total exports in GDP increased 16 percentage points to 43%1 from 2005 to 2017 (Figure 7). This increase reflects a structural business restructuring process towards tradable sectors, which began well before the international financial crisis. Furthermore, it is largely unrelated to changes in price competitiveness. Real effective exchange rates increased from 1995 to around 2005, but remained fairly stable until recent years, when a slight decline became noticeable (Figure 9). This is in stark contrast to the conventional view discussed above. Source: Authors’ own computaions based on Eurostat; Methodology FIPEI, exclunding Public Sector. Source: European Commission, Price and Cost Competitiveness - Data Section 2016. Portugal’s turnaround has also been supported by important changes introduced in employment legislation over the past 15 years. There have been multiple reforms that have targeted the internal flexibility of firms, such as the adjustment in hours worked, unemployment insurance, restrictions on firing, and the ability to sign temporary contracts, making the labour market more flexible and adaptable to shocks. In the 2001–07 period, worker flows in Portugal, including job creation and destruction rates, were remarkably close to those prevailing in the US. The same applies to wage flexibility. The Portuguese labour market has levels of wage flexibility similar to other advanced economies. More recently, efforts made to stabilise the Portuguese banking system and reform its governance have played a critical role in restoring growth after the crisis. Strengthening the banking system was key to increasing credit flows and to improving the efficiency of capital allocation (Castro et al. 2004, Amador and Nagengast 2015). Those efforts included strengthening banks’ capital bases, changing shareholder structures, clarifying the mechanics for resolution procedures, and helping create appropriate conditions for bank’s operational results to return to positive ground.2 In 2017, the Portuguese banking system returned to positive results. Impairments costs and provisions declined sharply. Banks’ capital base improved (the Common Equity Tier 1 ratio stood at 13.9% at the end of 2017, 2.5 percentage points higher than at the end of 2016). The stock of non-performing loans (NPLs) fell from €50 billion in mid-2016 to € 37 billion in 2017. The NPL ratio is now at 13.3%, having dropped 3.9 percentage points from late 2016 and 4.6 percentage points from June 2016. The crisis produced damaging effects on the public finances, which came on top of problems accumulated in the 2000s. Yet, Portugal has shown great resilience in the way it has committed to and persevered in restoring the balance of the public finances, through reforms designed to deliver structural fiscal consolidation. The current government’s strategy relies on rigorous, prudent management of public expenditure, able to respond flexibly and effectively to changes in the macroeconomic environment. It aims to strike the right balance between the debt-reduction goal and the need to protect growth. To improve public spending efficiency, the government has been conducting an expenditure review designed to help line ministries generate genuine, long-lasting efficiency gains that can work towards containing expenditure, while at the same time ensuring that inevitable demand pressures on public services can still be accommodated effectively within the existing fiscal envelope. Portugal has turned a corner. Having gone through a mild boom, a slump, and a severe recession, all packed in less than two decades, the Portuguese economy has re-emerged with a newfound strength. Important challenges remain. Some are burdensome legacies from the crisis. The stocks of private and public debt are still high. Increased savings, both internal and external are required. Youth unemployment and long-term unemployment have not yet returned to pre-crisis levels. The financial sector still has some way to go on its way to full health. To keep the public finances on a consolidating trajectory, public expenditure will have to continue to be very carefully managed. Crucially, though, Portugal’s ability to rise to these challenges is considerably stronger today than at any time in the last few decades. 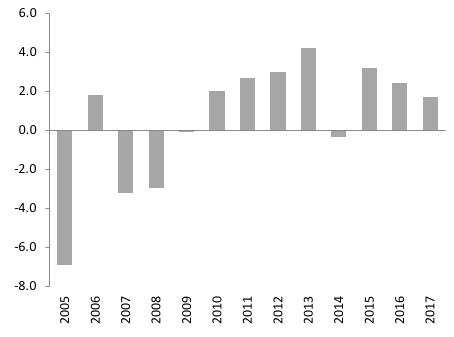 The current combination of robust economic growth, powered by investment and exports, balanced external accounts, and public finances on a consolidating path, is a far cry from the experience of the late 1990s and 2000s, and bodes well for the performance of the Portuguese economy in incoming years. However, further reforms, demand, and patience are still of the essence. Amador, J and A Nagengast (2015), “The effect of bank shocks on firm-level and aggregate investment”, Banco de Portugal, Working Papers 2015 no 15. Autor, D, D Dorn, L Katz, C Patterson and J Van Reenen (2017), "Concentrating on the fall of the labor share", American Economic Review 107(5): 180–85. Baumann, U and F di Mauro (2007), “Globalisation and euro area trade: Interactions and challenges”, ECB Occasional Paper 55. Bayoumi, R T, J Harmsen and T Turunen (2011), “Euro area export performance and competitiveness”, IMF Working Papers 140. Blanchard, O and P Portugal (2017), “Boom, slump, sudden stops, recovery, and policy options: Portugal and the euro”, PIIE Working Paper 17-8. Bricogne, J-C, L Fontagné, G Gaulier, D Taglioni and V Vicard (2012), “Firms and the global crisis: French exports in the turmoil”, Journal of International Economics 87(1): 134–146. Bugamelli, M, S Fabiani, S Federico, A Felettigh, C Giordano and A Linarello (2018), “Back on track? A macro-micro narrative of Italian exports”, Bank of Italy Questioni di Economia e Finanza (occasional papers) 399. Castro, R, G Clementi and G MacDonald (2004), “Investor protection, optimal incentives, and economic growth”, Quarterly Journal of Economics 119(3): 1131–1175. Chen, R, G Milesi-Ferretti and T Tressel (2012), “External imbalances in the euro area”, IMF working Paper WP/12/236. Corrado, C, J Haskel, J–L Cecilia and I Massimiliano (2016), “Intangible investment in the EU and US before and since the Great Recession and its contribution to productivity growth”, EIB Working Paper 2016/08. Di Mauro, F and K Forster (2008), “Globalisation and the competitiveness of the euro area”, ECB Occasional Paper 97. Dias, D, C R Marques and C Richmond (2015), “Misallocation and productivity in the lead up to the Eurozone crisis”, Board of Governors of the Federal Reserve System, International Finance Discussion Papers 1146. EC (2016), “Ex post evaluation of the economic adjustment programme – Portugal, 2011–2016”, European Commission Institutional Paper 040. ESM (2017), “EFSF/ESM Financial Assistance – Evaluation Report”, European Stability Mechanism. Gouveia, A and M C Coelho (2018), “The Portuguese economy: Short essays on structural changes”, Gabinete de Planeamento, Estratégia, Avaliação e Relações Internacionais, Ministry of Finance, Portugal. IMF (2017), “Portugal - Fifth post-program monitoring staff report”, International Monetary Fund, European Department. Jones, C I (2016), “The facts of economic growth”, Ch 1 in J Taylor and H Uhlig (eds), Handbook of Macroeconomics, 2A, Elsevier. O'Mahony, M P, C Corrado, J Haskel, M Iommi, C Jona-Lasinio and M Mas (2018), “Advancements in measuring intangibles for European economies”, EURONA 2017(2). Osterhold, C and A Fontoura Gouveia (2018),“Should we fear the walking dead? The role of zombie firms”, GPEARI Working Paper, January. Reis, R (2013), “The Portuguese slump and crash and the euro crisis”, Brookings Papers on Economic Activity 46: 143-193. Reis, R (2015), "Looking for a success in the euro crisis adjustment programs: The case of Portugal", Brookings Papers on Economic Activity 46(2): 433-458. Storm, S and C Naastepad (2015), “Crisis and recovery in the German economy: The real lessons”, Structural Change and Economic Dynamics 32(1): 11–24. This increase, which started before the crisis and was amplified by it (European Commission 2016), is more than 5 percentage points above similar increases in the 19 euro area countries. It is composed of a rise of 10 percentage points in goods and of 6 percentage points in services (which doubled their weight). Examples of initiates targeting banks’ capital base and shareholder structures include the resolution of Banif and integration of its business in Santander in 2015; successful capital raising by BCP (including the acquisition of an important part by the Fosun group) in 2016 and 2017; the acquisition of BPI by La Caixa and reduction of its exposure to Angola in 2017; recapitalisation and a new business plan of CGD in 2017; and the selling process of Novo Banco to Lone Star in 2017. Also, in 2017, the reimbursement profile of the Resolution Fund debt was extended, allowing the banks’ contributions to be spread further in time, thus avoiding large, sudden impacts to the banking system.